Severely disheartened, we continue on. We spend a cold night camping in a field. There have been a number of cold nights lately. This one's made a little less uncomfortable by a few liters of steaming hot water we had poured into our Nalgenes and thermoses from a friendly cafe owner on the way out of Arles. We stuff them into our sleeping bags and curl around their warmth until, by the early hours of the morning, they've gone cold. We pour hydrogen peroxide into Lauren's ear and watch it foam and fizz. It maybe dislodges things a little, but she's still suffering. Still mostly deaf. This is a big-city job, and the next big city is still far in the distance. We ride on. Typically, we plan our routes with a great little app called Komoot. It's easy to use and mostly reliable. But sometimes, we double-check our route with Google Maps beta bicycling directions. And if we see some something different—something much shorter, something much flatter—we give it a go. Google Maps is not very reliable. It's not that it's bad, necessarily. It's not that we have a bad time using it. It's just that Google Maps beta bicycling directions takes a very broad, creative interpretation to what can be counted as a road, and what roads can actually be cycled. We follow Google's route, and it steers us through private farms, personal access ways, muddy cul de sacs, impassable goat trails, grassy canal towpaths, and crumbling, possibly abandoned military bases with big stern warnings in French out front that we can't understand and thus ignore. So while the route is indeed a shorter distance and flatter grade, it is neither quicker nor easier. We travel about thirty kilometers and this takes maybe five or six hours. It's fun, though. It's an adventure. We see almost no cars nor people all day, because these paths seem like old relics from a forgotten time. It's a little eerie, and mostly quiet. We get barked at by the occasional dog and startled by the occasional heron. 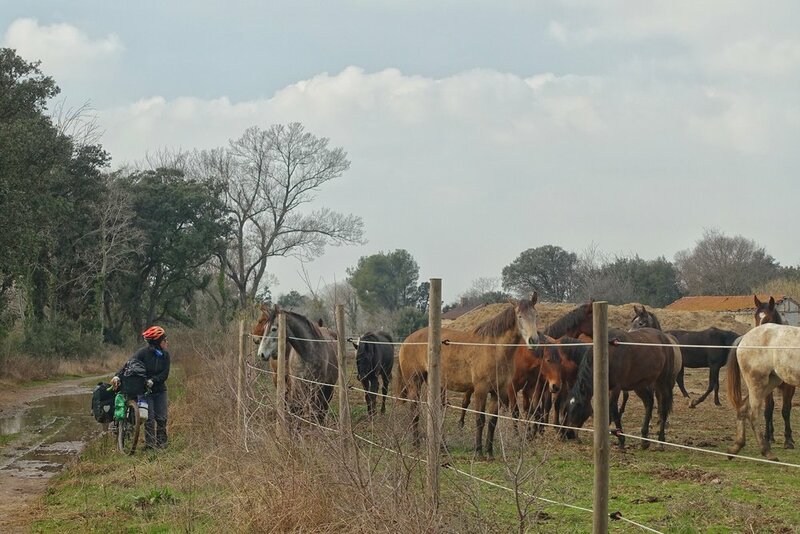 In the afternoon, we happen upon a harras of beautiful brown and white horses grazing in a field, and they stampede over to the fence to greet us. It is not common for us to have animals run toward us; they're usually headed quickly in the other direction. Yet these horses are the most gregarious we've ever witnessed. They act like they haven't seen a human in months, and maybe they haven't. We meet at the fence and say hello and pet their snouts. We stare intently at one another, unsure of what to do next. When we finally continue onwards, the whole team of them trots alongside the fence to its northern edge to see us off. We stay with a lovely family in Miramas we'd connected with through Warmshowers. Collete greets us upon our arrival, and later we meet her daughter Sophie and her partner Matthieu. They welcome us into their home, put us up in a warm, cozy room, and make us feel like family for the night. I haven't really talked much about these experiences, the dozen or so Couchsurfing and Warmshowers hosts we've stayed with thus far in Europe. I've passed over them quickly, and it's not because they're not wonderful moments worth retelling. They most certainly are. First, a primer (if you're already familiar with the concept, or just don't care, skip seven paragraphs down to the next section break). Warmshowers and Couchsurfing are two independent websites. Each is free to join and free to use. You can use either site as a host, or a guest, or both. Hosts host people. Hosts put out an open invitation to the rest of the community (those who have joined the site) saying "hello, everyone, I happen to have some space in my home that you could maybe use." This space may be a couch, or a spot on the floor, or a camping pitch out on the back patio, or a private room, or occasionally even an entire flat. Hosts tend to make these spaces available for a night at a time, maybe two, or sometimes many more. Guests stay with people. Guests are travelers (the primary difference between Warmshowers and Couchsurfing is that Warmshowers is just for those traveling by bicycle; Couchsurfing is for everyone). Guests find hosts online and send them nice messages saying "hello, I am traveling through your area and would love to meet you, and maybe, if you're up for it, spend a night or two in your home, if that'd be okay." Sometimes it is okay. Sometimes it is not. Sometimes people are a good fit and sometimes people are not a good fit and sometimes people are available and sometimes people are not available. Sometimes hosts approve guests' requests, and sometimes they say "sorry, find somewhere else." But the key here, what sets these communities apart from a commercial endeavor like Airbnb, is that they are fundamentally non-transactional. That is, guests do not pay money to hosts. That is not to say that guests do not pay hosts. Couchsurfing and websites like it are often thought of as "free lodging." As a way to travel on the cheap. And sometimes people use it that way, tired backpackers hoping to bum a couch and take a nap. But that's not really the intent. Staying with a host is a lot like staying with a friend or family member. You don't pay for your stay; you just act kind and decent. You don't come back at three in the morning, loud from the bar, and sleep until noon. You don't leave dirty dishes in the sink. You don't go see the sights, then retreat to your room and flip through your phone like you might do if you're staying in an Airbnb or hotel. You try to contribute however you can: clean up after yourself, share some interesting conversation, maybe offer to cook dinner. You pay for your stay with time and with care. And in return you get not just a safe place to sleep, but a really special and intimate experience with someone whom you would probably never otherwise meet. You get long, winding discussions over a third or fourth glass of wine. You get surprises and new friends. You get something that feels human and communal and beautiful. You get a feeling of wanting to give back, not just to this person who has welcomed a stranger into their home, but to the wider world. You become someone who wants to welcome others into your home. You become a merchant in the gift economy. Is it safe? Yes, it's very safe. Guests write reviews for hosts and hosts write reviews for guests and creeps get weeded out of the system pretty quickly. Is it fun? Yes, it's very fun. It's fun for guests, who get all the great things mentioned above, but it's also fun for hosts, who get interesting people from every corner of every continent, if they so desire, waltzing through their home. They get great stories and new friends and good karma (quantifiable in the form of positive reviews) for the next time they do some traveling. Is it easy to get started? Yes, it's very easy. You, the person reading these words right now, can join either community (Warmshowers, just for cyclists like us, and Couchsurfing, for everyone) today. If you want. So these experiences are wonderful. They sound mushy when I describe them, and so I don't really delve in much. It's a lot of sitting on couches and drinking tea and talking late into the evening with people you've only just met but feel like you've known for years. It's a lot of arriving in a city or town like any other tourist but within thirty minutes finding yourself within someone's home, seated around someone's table, trying your hand at a language you don't really speak, and feeling like you're experiencing a whole different side of travel. Something less about collecting trophies—snapshots, checkmarks of sights seen and places visited—and more about enjoying the moment. Lots of warm and fuzzies, these experiences. But it's work, too. Sometimes we choose to camp in the cold because it's simply easier. We are tired and we know we won't make very good guests, and the last thing we want is to show up to someone's doorstep, ask Where's the couch?, and leave them feeling like they're just being used for their roof and their walls. It's work. The talking for hours, after riding through the cold for most of the day. The telling of certain stories and answering of certain questions that you've told and answered hundreds of times before. We tend to bring groceries and cook for our hosts (though many shoo us out of the kitchen and tell us dinner is their treat), and cooking is work. We wash dishes, and that's work. And we try to be communicative and punctual—we try to show up when we said we'd show up—and that's work, too. It's the good kind of work, definitely, but work all the same. We have an absolutely fantastic time with Sophie and Matthieu and a few friends that join them for the evening. They prepare a number of vegan dishes for us (totally unnecessary but tremendously appreciated) and help us dry out our tent (damp from condensation the night before) and in the morning invite us to stay another day. We'd love to. But we already committed to meeting our next hosts forty kilometers down the road by evening, and so we're forced to decline, which is a really crummy feeling. They, of course, understand. Our next hosts are every bit as lovely. Delphine, Marteen, and their two teenage daughters are a beautiful family. They recently completed a family bike tour through Italy, Slovenia, and Croatia, the parents astride a bright red tandem and the girls riding individually alongside. Over hefty lunches and long dinners, we discuss their lives in the south of France, American politics (a common topic for us), and the nuances of the French language. We stay two days. On our second day Lauren and I wander into the backyard to give our bikes some much-needed maintenance. We pull in our brake pads and clean our cassettes and oil our chains. Lauren adjusts her seat, which keeps slipping. My bike is turned upside-down on the cement, and I'm spinning the back wheel and listening for rub against the brakes. I let my fingertips slide against the cool, smooth surface of the wheel's rim. And then, a bulge where a bulge shouldn't be. I stop the spin and crouch down low and my heart sinks. There is a sharp one-inch gash in the hard, brittle aluminum of my rim's sidewall. My rim is cracked. In a ranking of things you don't want to have happen to your bike on a long bike trip, a cracked rim sits pretty high on the list.